The latest report from the Maryland Public Policy Institute is short and succeeds at clear and to the point. It is also damning. Its implications are clear: public pension funds all over the US would do better to fire their investment staffs and hand management over to Vanguard, using a simple mix of 60% stocks, 40% bonds. Anyone interested in public pension funds should circulate this study widely. 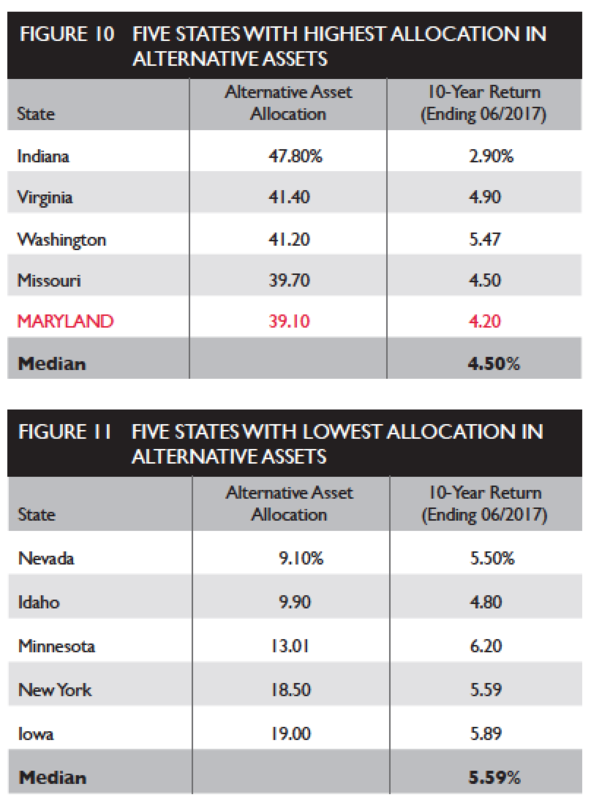 The overview of the report focuses on the underperformance and high fees paid by the Maryland state fund, but then discusses its broader findings: that the 33 state funds it studied underperformed that simple 60/40 stock/bond mix, and that the funds that paid more in fees typically did the worst. Note that the 17 states not included had different fiscal year ends or too skimpy information to be studied properly. So there is no reason to think they did any better. 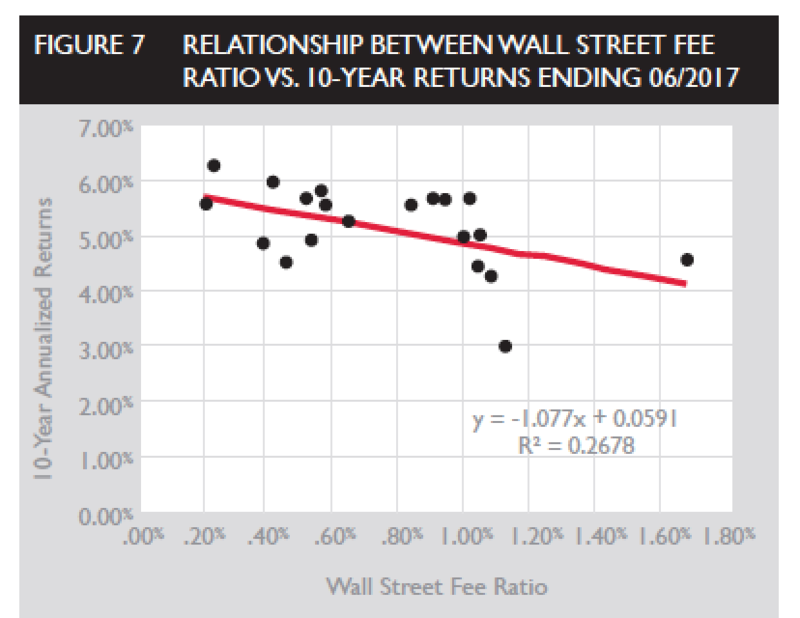 Our study revealed that the top five Wall Street fee states produced lower investment returns over the last 10 years when compared to the bottom five Wall Street fee states. As shown in Figure 5 and Figure 6, on a 10-year annualized return basis, the top five fee states produced a return of 4.34 percent, while the bottom 5 states returned 5.50 percent. CalPERS was actually in that low fee group, yet had the worst returns of that cohort, at 4.4%, which was more in keeping with the high fee group average of 4.34%. One problem the authors attempt to compensate for is the fact that public pension funds report their expenses inconsistently, and even the ones that make a diligent effort to report them all, like South Carolina, aren’t fully effective. In addition, for the states that invest in private equity (pretty much all), there is the additional problem of hidden fees charged at the portfolio company level and not reported to investors. Given the lack of reliable data, any approach to this problem is going to have shortcomings. For instance, the analysis winds up making South Carolina look like a high-fee state, when the appearance of it paying a lot in fees is due almost entire to its being the most comprehensive in reporting them. Similarly, CalPERS comes out being on the lower fee end. It ought to be by virtue of its size alone, but in fairness, it also does have a lower allocation to higher-fee strategies than many state pension funds in part due to its having renounced hedge funds in 2014. Human Nature: It is human nature to believe that your own fund can do better than others by selecting winning and losing investments, despite scientific evidence to the contrary, such as few mutual funds beating benchmarks for the last 20 years. Agency Problem: Consciously, or subconsciously, pension fund investment executives do not want to ‘index’ themselves out of a job. and lower risks, despite the apparent contradiction with modern finance theory. Note they didn’t include soft corruption, like the staffers that oversee private equity investments getting to go to annual meetings in desirable locations like London and New York with lavish food and entertainment, and that more elaborate investment strategies also justify board members going on junkets to conferences overseas. Again, this little report makes a cogent case for public pension funds to do better by doing less. But as the list above indicates, no one at these funds is going to want to cut heads or simplify their strategies, since that would also imply lower pay for those who remain. [Mathematician Benoit] Mandelbrot’s findings were a fundamental blow to economic theory, and have been recently popularized by Nassim Nicholas Taleb, who describes the realm where normal distributions work as “Mediocristan” and the realm where wilder forms of randomness apply as “Extremistan” and shows how most social, economic, and market outcomes reside there. Other elements of the financial economics superstructure started to look shaky. The CAPM essentially fell apart. One of the problems has been defining the “market” against which individual assets were valued. In principle, it should be much broader than the stock market, since investors buy more than stocks, and perhaps should include all investable assets. The consequences of including such aspects of reality are likely to be disastrous in terms of the usefulness of the resulting theory. . . . The capital markets line no longer exists. . . . Moreover, there is no single optimal combination of risky securities; the preferred combination depends upon the investors’ preferences. . . . The demise of the capital markets line is followed immediately by that of the security market line. The theory is in a shambles. At that time (1970) Sharpe nevertheless argued for continuing to use CAPM, invoking Friedman’s endorsement of unrealistic assumptions and the belief that even a flawed theory was better than no theory. If you want a simpler argument, the yawning 2% gap between what CalPERS, which hires the best consultants and by virtue its size can invest at lower fees within an investment strategy that pretty much anyone else, says that the theoretical benefits of diversification by asset class don’t appear to pay off in practice. That could be due to the fact that asset classes are no longer all that distinct, that returns march together much more than in the past (recall how the entire world seemed to be engaging in “risk on-risk off” trades in 2013 and 2014). Another proof is that hedge fund performance, contrary to the claims of its promoters, have been highly correlated with stock market performance since 2011. Similarly, private equity is essentially leveraged equity, and its apparent differences from stock market performance are largely the result of investor tolerance (indeed preference for) what are openly acknowledged to be phony (“smoothed”) valuations, along with lagged reporting (one quarter plus stale results reported as current). This entry was posted in Banana republic, Hedge funds, Investment management, Private equity on May 3, 2018 by Yves Smith. Thanks, Yves, for posting this rather scathing comprehensive report. It seems to me that a major problem in the US imperial finance system is the growth of private equity and the related firms at the expense of public equity markets. Why? 4) enforcement of equity regulation has been made exclusively civil, with large fines paid from shareholder funds regarded as the appropriate penalty for wrongdoing rather than criminal sanctions against those responsible. This is creating a general climate of impunity for bad behavior and severely damaging trust in the system, a trust which is necessary for the proper functioning of the system itself. In effect civil sanctions punish the shareholders and let the bad actors off scot-free. It’s symptomatic of a deeply corrupting ideology – epitomised by Mitt Romney, who remarked that he paid a lower rate of income tax than his secretary but thought that there was nothing wrong with that at all. Because he’s a member of a class for whom different rules apply than for the hoi polloi who work for a living – and who are still somewhat respected – unlike the 47% who pay no income tax, you know, the scum of the earth, the useless mouths, most of whom work for a living but make too little to pay other than SSI and Medicare taxes, which that moral exemplar Romney does not consider to be taxes at all apparently. Now Romney made an 18% compounded return for his investors during his time at Bain – this is all that counts, not the thousands he relegated to unemployment and lower standards of living so he could amass his scantly-taxed billions. In a sane world he and his gluttonously greedy ilk would be considered criminals. It’s easy to see the appeal of private equity to pension fund managers – 18% is better than double the return on the S&P 500 – but somehow the pension funds never make this kind of return from their investments in private equity. Quite the contrary, as this report makes clear. How is this to be understood but as yet another extraction of public funds to make private wealth for greedy flimflam artists? Not if the two asset classes are broadly defined — global stock market cap is around $100 trillion and outstanding debt is several times higher. Arguably property is a third broad asset class that should be included. But two or three asset classes are all you really need. Sad results from Wall Street’s victims illustrate an iron law of finance: in the aggregate, managed funds will achieve the market return less fees. No matter how they try, hedge funds and alternatives cannot create the alchemy to get around this dismal math. They seek the financial equivalent of cold fusion in a jar. Yes but – when Romney was at the helm, Bain returned 18% compounded annually to its investors – how do you square that? Unless you consider “Bain not equal to Wall St”? Or “Bain not equal to managed funds” – which I consider more dubious than the first. Please don’t promote the myth that private outperforms. We’ve been debunking that regularly since 2013. Romney left Bain Capital in 1999. That happened to be at the end of a run of the best years PE has has in the last 30 years, from 1995 to 1999. He timed his exit well. As we have written at length, private equity has not earned enough to justify its higher risks for now more than a decade. PE’s share of total equity more than doubled from the early 2000s to 2012. And there is no persistence of outperformance, so you can’t beat the averages by picking “top” funds. Bad example. Sorry but thx for the info. Here’s my point – all managed funds can’t underperform the market – it’s a mathematical impossibility: where many do underperform, the market being an average, a commensurate many must over perform. Unless good Mr. Haygood is arguing that all managed funds underperform and only other investors overperform? Correct, not all managed funds can underperform the market given that an average return is necessarily populated by returns above and below it. The challenge lies in consistently identifying specifically which manager will outperform the market in a given year. It is seldom the case that a manager can beat the market on a regular and consistent basis, and those that do for a period of time tend to attract more capital which results in the portfolio looking more and more like the market. It’s sometimes easier for smaller managers to outperform for a while, but they typically don’t stay small for long. This is true of private and public managers. This thinking isn’t as true for less efficient asset classes where good analysis can take identify investment opportunities that “the market” will catch on to later, but for most people – pensions included given their size – buying an S&P 500 Index will generate a perfectly acceptable outcome 99% of the time. With all due respect, I cannot believe you are arguing this. There is a vast literature debunking what you are saying. 1. There is no such thing as manager persistence. No one managing a fund of any size beats the market consistently. If you pick a top quartile manager from the last period, the odds that they will be top quartile this period are at best dart toss (for PE, the odds are worse than a dart toss). 2. Active managers underperform indexes due to higher fees. Anytime anybody has delved into the data since the 1975 paper, the conclusions are always the same. There are clearly many people with consistent skill out there (e.g. Peter Lynch at Fidelity Magellan) but you have to identify them BEFORE they have their great run, because once they have had their run, their funds fill up with money so they often can’t execute the same strategies that led to their great success. So that essentially turns successful active manager selection into a venture capital problem. Try getting your money out of a PE fund in 2001-3 or 2008-10. I think most PE and other alternative funds simply closed the cashier window in those types of timeframes, as much because they don’t want to mark their investments to anything resembling market at those times as that would shatter the illusion of out-performance. No, no, this is not correct. Please don’t comment here when you don’t know what you are talking about. This is not a chat board and we restrict the comment privileges of readers who mislead other readers. Your comment violates our written site Policies. Private equity firms by design are long term. They never never never allow investors to “get out.” The general partner is 100% in charge of when you get your money back. This has always been the case. The periods when markets were bad and PE funds weren’t selling companies have absolutely nothing to do with the structure of the fund, which every PE investor understands fully before they get in. PE funds are ten year vehicles and investors get all their money back in 8 to 15 years. The long time frame of PE is depicted as a Good Thing since pension funds are long term investors. PE funds also by design (this is clearly in the agreements) determine when they give the money back, not the investor (limited partners). That is because they are buying and selling companies. They wait for what they think is the right time to sell and even then it takes time. They return the funds based on when they sell the companies they’ve bought. The funds get wound up in a lumpy manner. The not marking their investments realistically at various predictable points in time does not have to do with the holding time. It is because they are not require to have the companies they own valued by independent parties. The argument goes that it would cost ~$30,000 per company per quarter, and that would kill investors returns. Investors accept the fund manager doing his own valuations and the fund managers cheat. Not all the time, because they’d be caught out when the investments were eventually sold. But they inflate them at certain times, like when they are raising money for a new fund or when stock markets are bad, and then work down the overvaluation. This is enough to distort overall returns reported for PE. Managed funds “in the aggregate,” I wrote. There will always be a distribution around the mean of outperforming and underperforming funds. But the value-weighted average performance will be the market return less fees. The higher the fees, the lower the net return. Ah I posted my last response before reading this. Yes and this is why passive funds with low fees are great – I have a couple of sectoral ones – but generally I prefer active management – by me! Vanguard Lifestrategy Moderate Growth Fund is a 60/40 fund that contains four funds (US stock, Intl ex US stock, US Total Bonds, Intl ex US bonds), has a 0.13% expense ratio, $3,000 minimum investment, and average 5.66% per year annual return (as of 4/30/18). CalPers would probably struggle to meet the minimum investment required and would be baffled on how the directors and fund managers could do various trips and conferences with only a 0.13% ER. The funds are set up so they rebalance between the four different funds, so if something goes up a lot or down a lot, the diversification benefit from rebalancing shows up. The international funds are not currency-hedged, so dollar rising and falling impacts relative balances between US and international as additional diversification. There is a distinct home market bias in the fund weightings, much more so in the bonds than stocks, so the international components are for diversification instead of major drivers. However, these international weightings clearly show that Vanguard has moved beyond Bogle’s long-held belief that international diversification wasn’t necessary beyond holding the S&P 500. The Vanguard Target Date funds basically pass down through the four Lifestrategy fund risk categories from Growth to Income over their lifespan and the Moderate Growth fund is roughly what a TD fund would contain at the target date. It is likely that the average investor could do better than most of the pension funds by investing in this one-stop fund. BTW – since my spouse has a NYS Teacher’s pension, I am pleased to see that NY has both decent long-term pension fund returns and it has one of the highest funded ratios. Given how screwed up much of the rest of NYS budgeting is, it is good to see that this is one bright spot that should result in one fewer long-term budget land-mine compared to many other states.. I always smile when I see unions investing in PE deals – it would be great if an academic could produce some data to net the jobs ‘created’ versus the jobs ‘creatively destroyed’ (or whatever the catchy phrase is) and consider the costs shifted from corps to gov’t by all these PE dealsters. Oh, and to the Bain boosters, how’s that Viewpoint deal going? I grimace. State and municipal employees live off the tax revenue generated by the “private” sector then hand some of those dollars to Pirate Equity, which destroys the tax paying capacity of the “private” sector that the government sector depends on. It’s a circular logic of who can extract the most for themselves before the system implodes, a race around the drain. To make the state pensioners whole, taxes fines and fees are going to be raised the most on those that have the least. Is a $1,000 dollar parking ticket in your future? When the game is this rigged, the only possible move is to play as little as possible. In my heavily Dem. city/state, there are lots of $100+ traffic fines. Inevitably it hurts the working poor the most. a $250 ticket can destroy a person’s finances if they’re living paycheck to paycheck. Traffic fines should be a deterrent/not unreasonably punative. And for nearly everyone a $20 fine is enough to learn their lesson. But the local Dem. city literally relies on fine revenue to plug its budget and delay tax increases. GOP towns do it too. But Dems. are supposed to be on the side of the working poor. I am curious what the specific benchmark indices are. 60% S&P 500 (US Stock) (example ETF: Vanguard VOO, 0.04% expense ratio), 40% Bloomberg Barclays U.S. Aggregate Float Adjusted Index (example ETF: Vanguard’s BND, 0.05% ER). Has NC ever wrote about Asset Allocation (AA) for individual investors? I understand any legal disclaimer “this does not constitute fiduciary advice” etc, but I’d be curious to read Yves (or others) take being a finance subject matter expert. AFAICT, the key is to stick with 1 of a few time-proven a “mechanical” Asset Allocations that are entirely index-based, such as this Bogle 60% stock/40% bond, or a variety of the Permanent Portfolio 1/3 each stock, 30 yr US Treasuries, gold. Contribute new money by buying the asset that you have currently have the least relative to the target, & redeem money in retirement (or given this is the US, medical or other financial catastrophe) by selling part of the asset with the most relative to the target.